The leader of India's main opposition Congress party, Sonia Gandhi, has retired from her post, the party confirmed on Thursday. Her son, Rahul Gandhi, has been elected unopposed as the new president and will officially take charge on Saturday. Mrs Gandhi, 71, has been the party president since 1998. She was elected to parliament in 1999. She is, however, not retiring from politics and will continue as a member of parliament, the party said. Mrs Gandhi entered politics in 1994 , three years after after her husband, former Prime Minister Rajiv Gandhi, was assassinated. Can Rahul Gandhi revive India's Grand Old Party? After distancing herself from politics following her husband's death, Mrs Gandhi was initially seen as a reluctant and almost reclusive politician. Under her leadership, the party turned in its second-worst performance since independence in the 1999 elections, but won the general elections in 2004 and 2009. Mrs Gandhi, an Italian-born Catholic, would have been the first foreigner to become Indian prime minister had she not surprised everyone by turning down the post after her general election success in 2004. 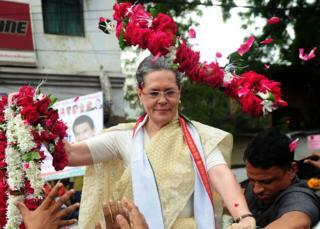 Yet, many considered her the de facto head of the Congress government. In recent years Mrs Gandhi has faced health issues. In 2011, she had surgery in the US for an undisclosed medical condition and in 2013 she was taken to hospital from parliament after falling ill.